I like watching the beachfront vacation home shows on television. Watching those shows get me inspired because the families know how to dream and they dream BIG! They are not afraid to take a step out of their comfort zone and move from where they are now to their dream destination. 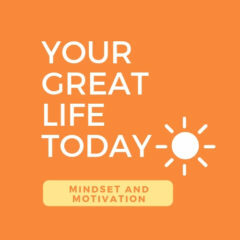 Your Great Life Today. Cleaning out the clutter to make room for an awesome 2015 . Hi, and welcome to the Your Great Life Today podcast. In this episode you will get to know a little about me and how I got introduced into the world of podcasting. I also discuss how some of the great motivation and inspiration that I have listened to over the years has helped me to make big changes in my life.